Confession: I weigh daily. Sometimes I want to chunk the scale out of my 2nd floor window and other days I get so excited I have to remind myself to step off the scale before I jump up and down with joy (don't want to break it, ya know). But I have a smart scale, and I have it set to display kilograms. Why? Because I have no emotional attachment to that unit of measurement. If I want to know my weight in pounds, I have to actually walk to the next room, pick up my phone, open the fitbit app, scroll down the page, and look at my weight. Most mornings, that's a lot of effort when I'm trying to fill my coffee mug. Usually by the time I get around to looking at my weight it's because I log onto MFP to log my food and see an automatic status update that I've had a loss! Go me!!! No loss, no reminder, no worries. There are good things and bad things about weighing myself daily. On the one hand, I get a really great, detailed log of my day-to-day fluctuations. And wow, are there some fluctuations. Frustratingly huge fluctuations. But it has helped me notice trends and I have learned things about my body that I never knew. Like if I eat a lot of salty foods, I should just expect both the numbers on the scale to go up and my fingers and toes to feel the excess fluid in my body. And TOM? don't even get me started on the fluctuations associated with that. But as a researcher and numbers person, I understand that more data allows for better understanding of trends, so I keep weighing myself almost daily. After9 months of doing so, I have found that I will sometimes go 3 weeks hovering around the same weight. Then I'll drop several pounds overnight. Sometimes the day-to-day difference is staggering. Sometimes it comes back, sometimes it stays gone. But as long as the overall trend is moving in the right direction, I don't let it get me down. I know what I'm doing is working, and with patience and perseverance I will reach my goals. Love the visual on the chart! You are so inspiring. Thanks for sharing this beautiful article! I am a numbers cruncher/researcher as well. What you say makes total sense about setting the scale to kg. I never thought of that brilliant idea before. I love the way you put 'because there is no emotional attachment to that measurement'. Ooooh, excellent! I weigh daily for the trends but also for the accountability feedback that I so desperately need to stay on track. I definitely need the accountability of weigh-ins. But I used to really freak out over the fluctuations. I would get depressed about it, which is why it's suggested that people don't weight daily. But once I got past that and started understanding the trends, I quit freaking out and now know it's just part of the process. I can almost predict when a big loss is going to occur (of course, now that I say that, my body is going to change things up, lol). I am a daily weigher (several times a day) person myself. I too have learned that fluctuations are normal and what I can expect. It helps me know that I'm not weighing in on a "heavy" day. I LOVE the idea of setting the scale to kilograms. Daily logger here too. You put it so well. I also love to look at my numbers and see what is happening with me everyday. Knowing if I eat anything that is unhealthy, the scale will go up, and I can hold myself accountable. Great idea to put it in kgs. I may have to try that! :) Love your graph too! my machine have the option but your graph look way better then mine must be because u have to go to the other room to get ur mobile..lol. Agree with u sometimes the progress makes me so happy that i am energetic to do some more workout and sometimes it makes me depressed enough to eat a full choclate bar. Good work keep it up. for me too. Almost every big drop is preceded by a gain of 1-2 pounds. I think that's really visible on the graph - it looks like an EKG printout at times. Love the graph! Makes a good point!! Awesome. Thanks and congrats! I also weigh daily. It is less stressful for me that way; once a week seemed like a lot of pressure on one measurement. I like the kg idea too! I do measurements and weigh-ins at the gym every 3 weeks. I like that I have an "official" measurements card and they do BF%, which is really my primary focus now. 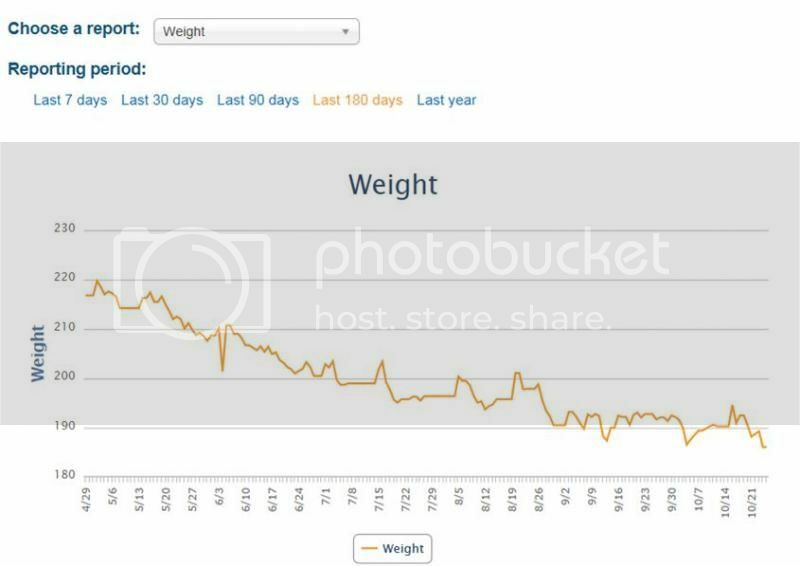 It's nice to know that its not just me I have my days and weeks and have not seen the scale move for a while. My pants are not getting any tighter so I am not worrying I know that in time those last pesky pounds will finally come off it took a long, long time to put them on (over 25 years) and this year and a half journey to a healthier me. I weigh daily for heart reasons & have the same fluctuations & frustrations. It's part of the loss game. Wish you good luck in your goals.